With its prime location in Theatreland, an award-winning record and a kitchen serving up holistic Indian food, it was no surprise to discover that Mela is popular with more people than us. On this, our third visit there, we struggled to even enter the restaurant, such was the queue – and this with a reservation on a Wednesday. Mela had been rated Best Indian Restaurant in London in 2001 – but had they kept their standards up? Once seated amid the noise and the chaos of a restaurant doing a roaring trade, we surveyed the menu as we waited for our drinks to arrive. And since last time it seems that evolution rather than revolution has taken place. Amongst the main courses I was pleased to see Lobster Pepper Fry still in pride of place at the head of the “exotic” section, and at an unchanged price. Helpfully, Mela still use chilli icons to denote how hot each dish is – this one gets maximum chilli marks. But we were left for far too long before anyone appeared to take the order – perhaps they were unusually busy tonight. Being quite unable to decide between starters, on the recommendation of the staff we opted for a platter of representative dishes which featured prawn, lamb shank, chicken, bhajiya – potatoes, spinach and onions spiced and deep-fried with sago pappadums, salad and a minty coconut chutney. The house red, a rich and pleasingly drinkable 2001 Sierra Grande Cabernet Sauvignon, washed this fare down for the bargain price of £12.95. With all the exotica about it would have been easy to be adventurous. Curries, stir fries, tandoor, traditional and exotic main courses vied for attention. The good selection ofnaanand roti (£1.95-£3.25) are indicative of the ease with which one can stuff one’s self quite silly at Mela. Of the rice choices, the standout – especially in price – is the seafood kedgree pulao at £11.95. A meal in itself, perhaps. Elsewhere, in the “traditional” section of the menu, Malabari seafood stew did its best to tempt. Billed as “a fine selection of seafood – mussels, scallops, prawns, squids and fish gently stewed with turnip, cauliflower, creamy coconut milk and corriander,” it sounded delicious enough to try it on a return visit. But my eyes were all for the Methi Machchi Tikkatonight – “chunks of salmon flavoured with fenugreek leaves in a yoghurt cheese marinade, grilled on an open charcoal fire” at £10.95. As fish goes, it’s difficult to go wrong with salmon, and thus it proved. It was as delicious, flavourful and quite as orange as it sounded. My companion opted for Murg Khasta Kebab (£9.25), “supremes of chicken marinated in cardamom and mace flavoured yoghurt with a touch of semolina, roasted in a tandoor to a crisp finish”. Anyone peering in our direction might have noticed two contented tandoori fans at feast. Yet another fascinating option came from this section of the menu – Barrah Beer Kebab; select cuts of lamb, soaked overnight in beer marinade. Kebabs and beer – how Friday night! There was nothing for it, we agreed as we tucked in to our delicately spiced tandoor offerings. We’d have to come back. Washing down the main courses with a recommended red from our waiter (the wines are largely sub £20 and this one, like the house offering of earlier, was rich and complementary) we decided against the tempting range of ice creams and other puddings. 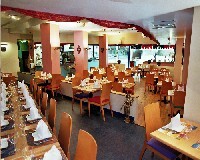 One needn’t dine at Mela for an a la carte rendition of uniformly excellent food. It’s possible to dip in for lunch, or a pre-theatre menu. However you decide to sample Mela’s impressive cuisine, make sure you reserve, and leave yourself enough time to get through the queues.